Montana redshirt freshman Garrett Graves talks to the media following the Grizzlies' second spring scrimmage on Friday at Washington-Grizzly Stadium. 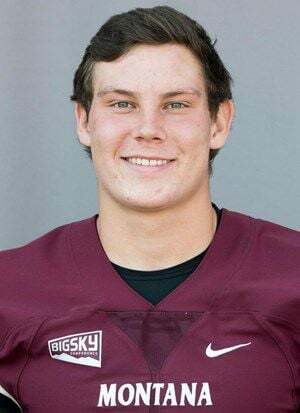 MISSOULA — Montana redshirt freshman quarterback Garrett Graves got to go live for the second consecutive spring scrimmage on Friday, exchanging his black no-contact jersey for a regular jersey during portions of the practice. The Eureka grad took 36 of the Grizzlies’ 88 offensive snaps at quarterback, up from 26 of the 94 he had during the first spring scrimmage on March 22. He threw 18 passes, ran 13 times and handed off the ball five times as he worked to display his versatility, physicality and speed. Graves might not end up starting at quarterback this season — returning starter Dalton Sneed is back — but head coach Bobby Hauck felt the live action was much needed for the 6-foot-3, 196-pound Graves if he’s going to be a contributor whenever and wherever he gets his shot. “Garrett’s a guy that can probably play eight positions for us on defense and five on offense,” Hauck said. “So, he’s going to be part of the plan moving forward. Graves didn’t crack the two-deep as a quarterback last season, running seven times for 18 yards as a running back. He played in just two games as he preserved his redshirt under a new NCAA rule that allows players to participate in up to four games without burning a year of eligibility. On the ground Friday, Graves converted a pair of fourth-and-1s, rushing for 3 and 7 yards. He also ripped off a 20-yard run on fourth-and-5 on the final drive of the day, scrambling out of the pocket to his right. He was tackled in the backfield six times, two of which came on what appeared to be running plays. In the first scrimmage, Graves had runs of 17 and 8 yards and showed his fearless physicality as a two-time undefeated state champion wrestler when he lowered his shoulder on All-American linebacker Dante Olson. Graves’ longest completion came when sophomore wide receiver Malik Flowers made a 33-yard reception in between two defenders on a ball thrown near the numbers on the left side of the field. Flowers was being covered closely by senior walk-on cornerback Kadeem Hemphill while sophomore safety Michael McGinnis provided help over the top. Graves completed 10 of 18 passes for about 76 yards and was picked off once on a pass that was tipped by Hemphill. He had at least one overthrow, one drop by a wide-open receiver and had each of his final four passes broken up by Hemphill. He was taken down by a sack or touch sack four times on what appeared to be passing plays. When the Griz close spring practice on Saturday with their spring game, Graves is hoping his work continues to pay off.